As a parent, there are so many milestones and developments to monitor for your child. But how many of them are related to their feet? Foot development in toddlers and children is crucial to their health, so here are 6 questions you should ask your child’s podiatrist at your next appointment. Does the type of shoe they wear affect how my child’s foot develops? Children’s feet start out as mainly fat and cartilage. Over time as they develop, the cartilage becomes bone. Footwear can have a big impact on the shape of a child’s feet as the cartilage starts to ossify. Depending on how fast your child is growing, there is no harm in measuring and checking your child’s foot and shoe size on a monthly to quarterly basis. Many shoe shops have foot measuring equipment just for children, or you can see your local podiatrist who can measure and check your child’s feet as well. Should my child go barefoot? It’s very important for young children and toddlers to have some time barefoot. If you’re at home, indoors or in a safe environment, you can happily let them loose barefoot. When out and about, the floor can often be unsafe – dirty, hot and with plenty of hazards – so always put shoes on your child to protect their feet when you’re out. Going barefoot will help them develop their feet and muscles and also help their balance, giving them the confidence to walk and run more. What features should we look for in children’s shoes? The most important features of children’s shoes are cushioning and support. Shoes that are too stiff or too soft will not provide the right kind of support for your child’s feet. A good level of cushioning will give your child’s feet extra shock absorption for walking and running. A shoe with a decent sole also ensures protection from sharp objects on the ground. Make sure the shoes aren’t too tight, but equally are not too loose. Laces can allow the shoe to become loose over time, so shoes with Velcro or straps instead of laces can be better for toddlers. How can I tell if a shoe fits my child correctly? There are a couple of simple tests you can do to check if the shoe fits your child correctly. Ask them to stand up while wearing the shoes and then slide their feet as far forward as they can in the shoe, so their toes are touching the front of the shoe. They should be able to fit their baby finger in between their heel and the back of the shoe. Any more or less and the shoe is too loose fitting. The next test is to get them to push their foot right to the back of the shoe, so there is no longer a gap between their heel and the back of the shoe. Now, there should be a gap of a thumb width (theirs, not yours!) between the tip of their longest toe and the front of the shoe. How often should my child see a podiatrist? This all depends on your child and their individual needs. However, at a minimum, your child should see a podiatrist on at least a few occasions throughout their childhood. This can help with screening for any potential future issues and pick up any current problems you may be unaware of. Consider taking your child to see a trusted children’s podiatrist at 12 months, 18 months, 3 years, 7 years and 12 years old. A children’s podiatrist can help to look after, treat and monitor your child’s foot development from the toddler years to teenage life. Rudo Makuyana is one of the podiatrists at The Foot Hub in Sydney. Rudo is passionate about foot health and treating patients holistically – not just the individual problem. 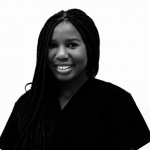 Originally from Zimbabwe, she completed her Bachelor of Podiatric Medicine at the University of Western Australia (School of Surgery) in 2011. She now practices in her foot clinic in Alexandria, Sydney and also volunteers and advocates for the rights of the world’s poor.